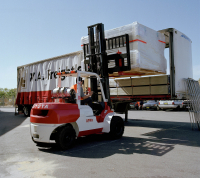 A 2.5-tonne payload Toyota 7FG25 forklift at ACI Glass Packaging’s Croydon (Adelaide) plant. Toyota Skid-Steer Owner Chases Half Century. A five tonne Toyota 7F6A50 forklift in operation at one of WA Freightline's Perth depots. 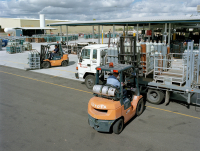 Toyota forklifts at work at BOC Gases' Canning Vale (Perth) facility. Mander Toyota has opened new premises in Orange, to service its customers in the NSW Central West. Mander's headquarters in Chester Hill in Sydney (pictured) has also been upgraded - with the first installation of illuminated Toyota corporate signage in Australia. Toyota Australia president Ken Asano (right) presemts the Toyota Industrial Equipment Distributor of the Year Award to Willtrac's Brian Williams and his wife Faye. At left is Steve Harper, senior manager of Toyota Australia Industrial Equipment. A Toyota 4SDK8 skid-steer loader. 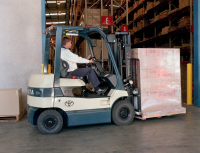 Toyota's 7-series forklift range. Models pictured are the 7FG25 Compact (left), 7FG30 (right) and 7FG18 (at rear). Austral Packaging Services has purchased a state-of-the-art Toyota 7FB25 battery electric forklift for its' Bankstown, Sydney factory as a key part of its' plans to grow the company.